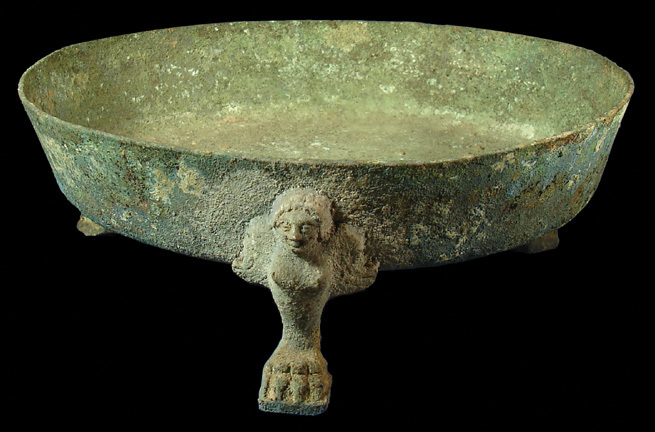 Important large bronze tripod bowl with feet cast in the form of winged sirens. The shallow flat-bottomed bowl is formed of thick sheet bronze. The wall of the vessel is angled slightly outward. Three feet in the form of a siren have been placed equidistant around the basin. 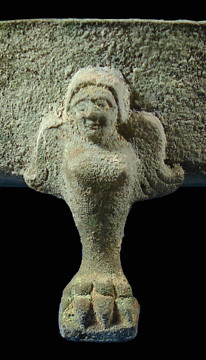 Each siren has a female head and upper torso with outstretched wings at the shoulder. Gently cast facial features are apparent, and the feathered wings are marked with incision. The creatures' bodies smoothly taper into a prominent lion's paw with large pronounced claws. The toes of each paw grasp and integral square base beneath each leg of the vessel. Nice emerald green patina over the entirety of the vessel. 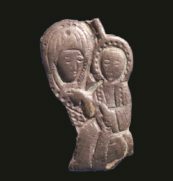 A wonderful and rare find on today's antiquities market for its outstanding size, fine state of preservation and well documented provenance. 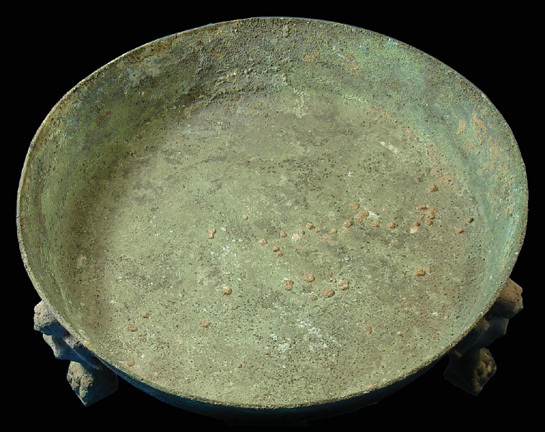 Ancient Etruscan vessels were nearly always made of hammered sheet bronze. Handles, feet and figural decorations were solid cast and then soldered together or joined with rivets. Condition: Intact except for one of the siren feet has been reattached. Overall nicely preserved. Provenance: The vessel was formerly in the Charterhouse School Collection, UK, built primarily between 1874 and 1940. A collector's number in yellow on the underside of the base: 31-60. 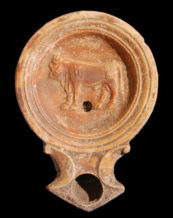 Reference: See The National Archaeological Museum of Naples (Italy 1996) , p. 45 for an example of a typical bronze ware group used by 5th Century BC Etruscan nobility for ritual banqueting, including a basin. Also see Greek, Roman and Related Metalware in the Royal Ontario Museum (Toronto 1984) by John W. Hayes, p. 171 for several examples of feet from tripod bowls cast in the form of a siren. Background: When the stories of Odysseus reached Italy and Sicily, the story of the sirens was transformed, and so too was their appearance. At this time, they became winged creatures with a woman's head. Their original persona as temptresses was also changed, and they were recognized as the singers of the dirge for the dead, and as the symbol of beauty, magic and eloquence. Thus, sirens often appeared as ornament on vessels and various ceremonial items as well as ornament on the tombs of beautiful girls and women.